National AgrAbility Mobile Optimized Site Goes Live. In order to stay on the cutting edge of web technology, the National AgrAbility Project has converted over from the former desktop-only web content to a new mobile-optimized website. When you go to the site, please send comments, questions, or criticisms through the use the Contact Us form on the agrability.org or to racz@purdue.edu. Please Join us in Celebrating 25 Years of AgrAbility! Tuesday, July 12th, 2016 ~ Noon – 2pm. Hyatt Regency Crystal City , 2799 Jefferson Davis Highway , Arlington, Virginia. Please RSVP at the following link to let us know you will be there!https://www.eventbrite.com/e/agrability-25th-anniversary-celebration-tickets-25260622201. Educational Stipends Available for RESNA Fundamentals Course and Conference. Are you an AgrAbility Team Member seeking the ATP (Assistive Technology Professional) Certification? Would you like to attend the RESNA Conference, help us tell the AgrAbility story at our exhibit and join the Celebration of 25 Years of AgrAbility? A limited number of educational stipends are available for AgrAbility Team Members to attend RESNA’s Fundamentals in Assistive Technology Course and the RESNA Conference. Please complete the attached application by May 31st, 2016 to be considered for this opportunity. Stipends will cover the pre-conference Fundamentals in Assistive Technology Sessions, RESNA Conference and AgrAbility 25th Anniversary Celebration luncheon! RESNA and NCART collaborative joint conference - "Promoting Access to Assistive Technology." Chuck Baldwin, NAP special populations outreach coordinator, attended the National Training Workshop in Colorado and especially enjoyed making new acquaintances, renewing old ones, and videoing the keynote speakers and other events/attendees. Among those acquaintances were 30 people representing 12 different 1890 land grant universities' staff, clients, stakeholders, and partners. This was a new record for 1890 involvement in the NTW, and the event was certainl y enriched by their participation. 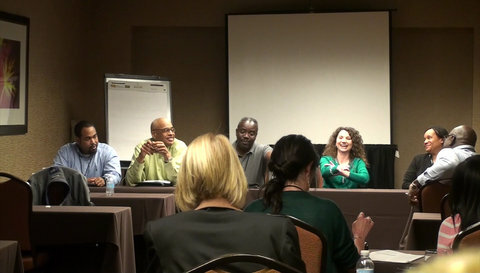 Chuck had the honor of being the moderator for the Wednesday afternoon NTW session "Working With Your 1890 Institution". The major contribution was given by a panel of five 1890 staff members: Dr. Paula Faulkner, North Carolina A&T; Melissa Stewart, West Virginia State; Glyen Holmes, Florida A&M University; Louie Rivers Jr., Kentucky State University; and Dr. Harold Mellieon, Southern University. Their insights were a valuable contribution to the understanding of those who attended. Their sharing was followed by a lively discussion with the audience, among whom was Aida Balsano, representing USDA/NIFA. Aida expressed her great pleasure in the contribution of the 1890 panel to the NTW, as well as for the active participation of the audience at the 1890 session. She encouraged the 1890 participants to be more vocal and proactive in communicating the needs of the 1890s to USDA/NIFA, and to consider stronger participation in applying for AgrAbility project grants. Amber Wolfe, AgrAbility project coordinator for nationally funded AgrAbility partner, the Arthritis Foundation Heartland Region, presented a poster at the American Occupational Therapy Association's annual conference in Chicago, IL, on April 9th. Titled "Gardening & Arthritis: The Relationship Between Gardening Tasks, Pain Management, Modified Tools, and Assistive Devices" it was very well-received during the two-hour session, and over 15 new contacts were recorded. In addition, 50 copies of the new "Arthritis and Gardening" booklet were handed out to occupational therapists in attendance.